A view of Mt-St-Michel from the causeway. The Arcade Tower in lower center provided lodgings for the Abbot’s soldiers. On the northwest coast of Normandy, France lies the most striking image of medieval Europe – the abbey fortress of Le Mont-St-Michel. The fortress and tiny village is now an island connected to the mainland via a causeway. At one time the area surrounding the mount was forest and now it is a vast tidal flat—the tides are very strong and in the Middle Ages provided excellent protection, along with the natural defenses of a steep hill surrounded by walls and towers. There is no better image of medieval Europe than this soaring abbey sitting on a rock pinnacle surrounded by a village and walls and towers. Exterior view of the Refectory and Knight’s Rooms. The three stories of the monastic complex were built in only 16 years. Interior view of the Knight’s Room. The room was named after the Knights’ Order of Saint Michael created by Louis the XI. This was the scriptorium (or study) where the monks devoted their time to copying texts and studying ancient manuscripts. The site was dedicated to Saint Michael, the patron saint of high places on the 16th of October, 708 by St. Aubert, the bishop of nearby Avranches. Construction of the abbey and associated buildings were done in phases over hundreds of years, requiring design ingenuity and engineering due to the steep slope of the mount and the weight of the huge stone buildings. The site became a Benedictine abbey in 966, and a few monks still remain. The abbey buildings we see today are mainly from the 13th – 15th centuries, although the original foundations of the abbey date back to 1017. The picturesque belfry and spire were added in the 1800’s. Walking up the Grand Rue to the Mt-St-Michel Abbey as pilgrims have done since the 12th century. Mont-St-Michel was a pilgrimage site, and saw a large number of pilgrims, including children (called “The Pastoureaux”) which first took place in 1333, and continued until the French Revolution in the late 1700’s. They were typically boys ages 8-12, sent by their parents to ask the Archangel Michael to save their families from the plague. Many of them never made it home, due to the dangers and risks associated with such a trip. A view of the abbey towering over the village. 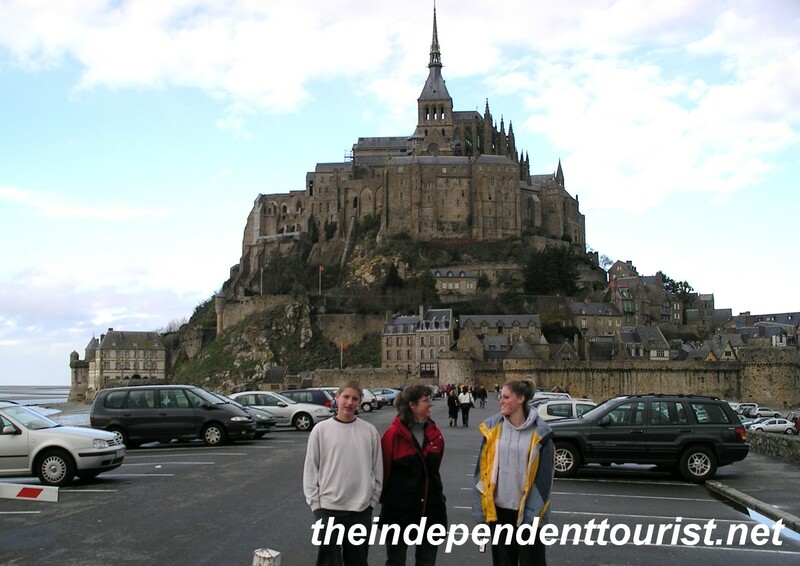 The drive to Mont-St-Michel takes about 4.5 hours from Paris (235 miles or 378 km). We flew in to Paris in the morning, rented our car, and were at the mount by early afternoon. I recall the last segment of our drive, just as we passed the town of Avranches, when my daughter yelled out “there it is!” It was thrilling to see the mount in the distance, soaring above the grey sea against a cloudy sky. No problem parking on the causeway on our way in to Mt-St-Michel. This area of France has a number of interesting sights including the beaches where the Allied forces landed on D-Day in June 1944. I suggest visiting Mont-Saint-Michel early or late in the day—the mount receives over one million visitors a year, and is one of the most popular sights in Europe, let alone France. If you want to reduce the crowd effect even more, visit off-season. We visited in November and had no problem parking or gaining entry. The walk up to the abbey is very steep, with many steps along the way. Mont-Saint-Michel is 378 km west of Paris Charles De Gaulle airport. 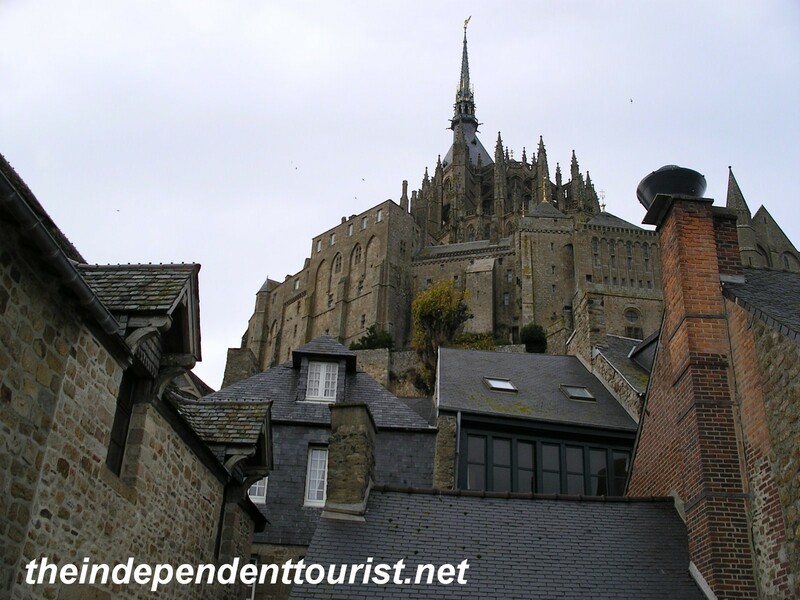 If you visit France, do not miss the premier sight of Mont-St-Michel. Also, just across the English Channel near Penzance, England is the “sister” to Mont-Saint-Michel, called “St. Michael’s Mount.” While not quite on the grand scale of Mont-Saint-Michel, it is still a great sight, and is also an island just off the coast, with walkway that is covered at high tide. View my post on St. Michael’s Mount here. Reference: Mount Saint-Michel by Jean-Paul Benoit, Editions Jean-Paul Gisserot. Posted in France and tagged France Travel, Mont-Saint-Michel on August 30, 2012 by Paul Terry.